This Sacrament is one of the two Sacraments of Healing (the other is Anointing of the Sick). The Sacrament of Penance is a Sacrament instituted by Jesus Christ in his love and mercy. Every human on earth has a problem with sin. Sin is a universal problem, but the Lord, in his loving kindness and mercy, has provided forgiveness for everyone who will accept it -- Jesus Christ through the Sacrament of Penance. We are reconciled through the Sacrament of Penance/Reconciliation. Jesus entrusted forgiveness of sins to the Church. The Sacrament is God&apos;s gift to us so that any sin we commit after Baptism can be forgiven through grace. The priest, serving in the name and person of Jesus Christ during confession, is the conduit of God&apos;s grace and mercy as he gives absolution. 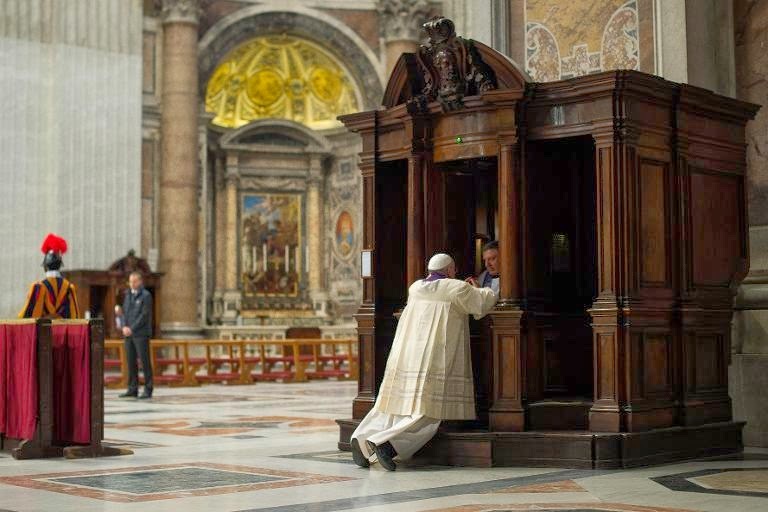 God is the one who forgives us through the graced action and prayers during confession. We become reconciled to God and the Church through absolution. We become closer to God and recognize more fully that we cannot live without God -- "For &apos;in him we live and move and have our being,&apos; . . ." (Acts 17:28) All of the Sacraments bring us the experience of Christ&apos;s passion, death and resurrection, but the Sacrament of Penance/Reconciliation "is the unique Sacrament of mercy." Baptism is the prerequisite for the reception of any other Sacrament. Children should be enrolled in the second grade of school in order to be enrolled in the First Reconciliation/First Communion class of St. Mary&apos;s Religious Education Program. In this case, please contact the Director of Faith Formation, Patricia St. Amour at 254.773.4541 ext. 14. For adults, First Reconciliation and First Holy Communion are among the rites of the Rite of Christian Initiation in Adults (RCIA). In most cases, adults, who seek sacramental reception will enter into preparation for the Rite of Christian Initiation of Adults (RCIA). In regards to RCIA, please contact the Parish Office at 254.773.4541.